Linking to third-party websites used to be anathema to the traditional media mindset — why would we send people AWAY? We want to keep (read: trap) them HERE. Attitudes began to change when an online media company that did nothing but send people away started making billions in advertising (i.e. Google). Still, most media companies resist opportunities to link to other sites — which is particularly acute in instances when linking to other sites could create a lot of value for readers. Articles on the sites of most traditional media publishers still don’t contain inline links, as most blogs do, i.e. these articles conform to print publishing standards rather than web-native publishing standards. This is not surprising as the majority of traditional publishers still recycle all of their print content online (and why shouldn’t they — it’s great content that cost a lot to produce). But reluctance to link out still abounds. For example, I was checking out the NYTimes.com Auto section because I recalled that they were using third-party content — and indeed, there is content from other sources, like J.D. Power and New Car Test Drive. Of course, the New York Times has deals that lets them host all of this third-party content, rather than link to it on the other publisher’s site. 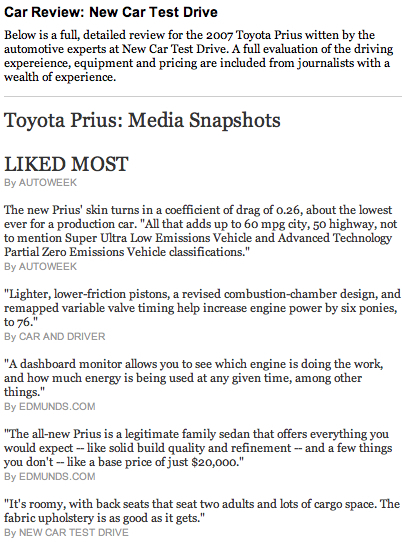 The New York Times Review is not yet available for the 2007 Toyota Prius. Click on the link below to view a full, detailed review for the 2007 Toyota Prius written by the automotive experts at New Car Test Drive. Wow, I thought — the New York Times doesn’t have any content on this topic, so they created value by aggregating the best third-party content. That’s the way to go. Intuitively, I went to click on the links for these other reviews…but there were no links. In print, this aggregation of quotes would create a lot of reader value. But on the web, the failure to link to the sources is overtly hostile to users. And that’s a shame, because the New York Times is missing a great opportunity — if they linked routinely to the best third-party cars reviews, they would actually REINFORCE the value of NYT Auto as a DESTINATION. This is completely counterintuitive to the traditional media mindset, but it makes perfect sense on the web. The problem that most traditional publishers have is that they see aggregation of third-party content as being in conflict with the distribution of their own original content. In fact, aggregating links to third-party content is highly COMPLEMENTARY to publishing original content. Traditional publishers need to stop applying monopoly distribution thinking to web publishing. On the web, the more you direct people to other useful nodes on the network, the more they will keep coming back to your node as a starting point.